This big Piggy is just too cute. And tough to boot! From the Barn Yard Series, she's made by Tuffy, the makers of the world's toughest soft toys for dogs. If you're looking for a cute companion for a dog who likes to go a bit chompers, this pig could make a great match. She's rated 7/10 for Tuffy durability. At 35 x 15 x 20 cm this is a good sized toy for a medium to large dog. What's great about Polly Piggy aside from her gorgeous looks? Each toy is made with 3 layers. The first layer is made of 600 D industrial grade luggage material. The second layer is plastic coating. The third layer is soft fleece on the outside. All of these layers are stitched together to make one super strong layer of material. Each toy is sewn together with 2 layers of cross stitching and then 2 layers of linear stitching. After the toy is sewn together an additional piece of black trim is added to cover the four rows of stitching. This extra piece of black trim is sewn with 3 linear stitches to give the product a total of 7 seams! This toy is a lot tougher than other soft toys and is actually rather hard. My dog loved carrying it around the house! 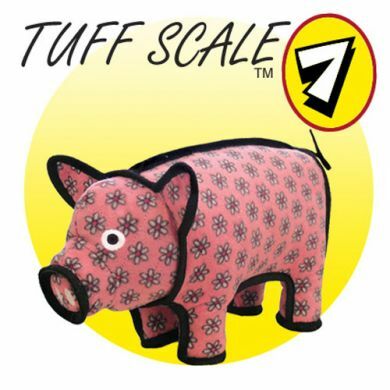 Read 2 customer reviews of Tuffy Toys Polly Piggy. The average customer rating is 2.5. In the end it was still not strong enough for my staffy's jaws (as expected) but it still lasted her a fair few play sessions and I'm sure she would say it was well worth it! Unfortunately NOT tough at all, took less than 5 mins for my staff to rip open the leg and begin disembowelling the poor piggy in front of the whole family Xmas Day!! !